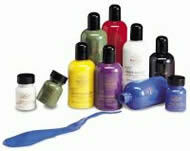 Liquid Paints produce sizzling instant color detailing for face, body, and hair. The quick drying formula produces a vibrant finish for detail on skin or prosthetic appliances. 1 oz. includes application brush. 1 oz. includes application brush. Alcohol-free. Cleans up fast with soap and water. Available in a variety of fun and vibrant colors. Sizes: 1oz. with application brush, 4.5 oz., 16 oz., and 1 gallon. The flesh tones provide the perfect choice for body makeup for choruses, crowd scenes, and large scale productions. Colors can be blended to create "custom" colors when required and may be used in the hair for a fantasy look. Used for face painting purposes at events all over the world.